With the football season ending this coming weekend, baseball is now visible on the horizon. The AppleSox' 2019 season-opener against the Victoria HarbourCats at Paul Thomas Sr. Stadium is nearly four months away. While the team is still being assembled, the anticipation of Opening Day only grows with each sunrise. However, seats continue to quickly fill up for the big 20th-season in team history. 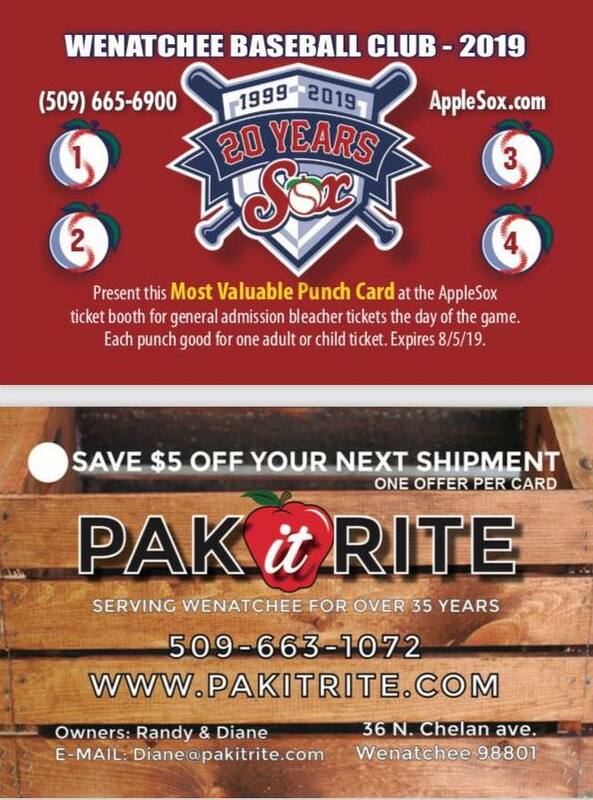 Lock in yours today by purchasing an AppleSox MVP Card, sponsored by PAK-it-RITE. MVP Cards give you four tickets to any 2019 AppleSox game for just $20 (a savings of $8). As an extra perk, the MVP Cards include a $5 discount on the back for your next shipment at PAK-it-RITE. AppleSox MVP Cards are also a very popular way for youth groups, service clubs and non-profits to raise money. Your group gets to keep half of the retail sale price for every MVP Card sold. The best part is that the AppleSox will buy back any MVP cards that you don’t sell! Purchase yours today at PAK-it-RITE today on 36 N. Chelan Ave. in Wenatchee. They are open from 8:00 a.m. until 5:30 p.m. Monday-Friday and from 8:00 a.m. to 2:00 p.m. on Saturdays. Season tickets are flying off the shelves but still on sale as well. Secure seats to Opening Night, Fireworks Night and other great promotional nights with seats to all 31 home games. Season-ticket plans run as low as $115 and can be purchased at the AppleSox team office on 610 N. Mission St. #204 between 9:00 a.m. and 5:00 p.m. on weekdays. While you're purchasing tickets, be sure to suit yourself up in the hottest AppleSox gear. Whether it's a cap or socks, we've got the Sox swag for you! We've partnered with prominent brands like New Era and Strideline and we know that we've got the perfect product to help you rep the Sox. If you have any questions, email info@applesox.com or call 509-665-6900.